← Do You Have Shiny Object Syndrome? It’s Here! Our very first book – and one we are so excited about, too. 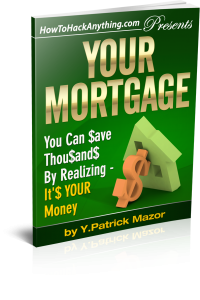 Written by my friend, Y. Patrick Mazor, (and edited by me), this book will open your eyes about what you never knew about mortgages – especially the one that counts – YOUR Mortgage – You Can Save Thousands by Realizing It’s YOUR Money! The book is available on Amazon.com, (affiliate), and we are proud to announce that this is only the first in what we hope to be a series of helpful and informative ebooks hosted by HowToHackAnything.com. Already, there are several more ebooks in the planning! It has been a real treat working with Patrick to produce this ebook. Having bought several homes in my lifetime and having signed so many papers my head was swimming (such a scary feeling), it’s wonderful to know that there really IS someone out there who not only knows what all those papers are about, but can explain them in words that “real” people can understand. Not only can Patrick explain your mortgage in layman’s terms, he can show you how to significantly reduce the amount of money you pay for your home, and he shows you where dangers and the big savings are. Here is a list of chapters in YOUR Mortgage. Whether you are about to buy a house, refinance your current mortgage, or just want to know what you really got yourself into when you sat down to “sign your life away” at your last home purchase, this is a book you can’t be without!